The ViewMenu container defines a menu in a View container. 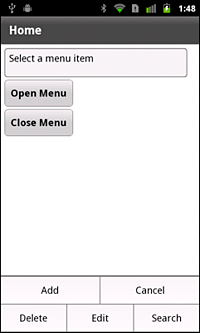 Each menu item is defined by using the ViewMenuItem control. The application container automatically creates and displays a ViewMenu container when the user presses the device's menu button. You can also use the ViewNavigatorApplicationBase.viewMenuOpen property to open the menu programmatically. The ViewMenuLayout class define the layout of the menu. Alternatively, you can create your own custom layout class. Notice that you do not explicitly define the ViewMenu container in MXML. The ViewMenu container is created automatically to hold the ViewMenuItem controls. The menu item that is currently in the caret state. [read-only] Contains true when the container is open and is currently showing as a pop-up. The Vector of ViewMenuItem controls to display in the ViewMenu container. Enables moving the pop-up when the soft keyboard on a mobile device is active. Enables resizing the pop-up when the soft keyboard on a mobile device is active. Changes the current skin state to closed, waits until any state transitions finish playing, dispatches a PopUpEvent.CLOSE event, and then removes the container from the PopUpManager. Opens the container as a pop-up, and switches the skin state from closed to normal. Positions the pop-up after the pop-up is added to PopUpManager but before any state transitions occur. Called by the soft keyboard activate and deactive event handlers, this method is responsible for creating the Spark effect played on the pop-up. The menu item that is currently in the caret state. A value of -1 means that no item is in the caret state.